Maintenance script that fixes timestamp corruption caused by one or more webservers temporarily being set to the wrong time. Definition at line 36 of file fixTimestamps.php. Definition at line 37 of file fixTimestamps.php. 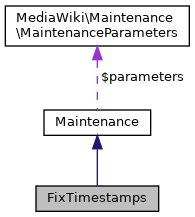 Definition at line 45 of file fixTimestamps.php. References $res, as, DB_MASTER, Maintenance\fatalError(), Maintenance\getArg(), Maintenance\getDB(), Maintenance\output(), and wfTimestamp().